So you've decided to D.I.Y your wedding make-up.. maybe because you're eloping, having a destination wedding, on a strict budget, or you'd just prefer to beat your own face because no one knows your face like you do. 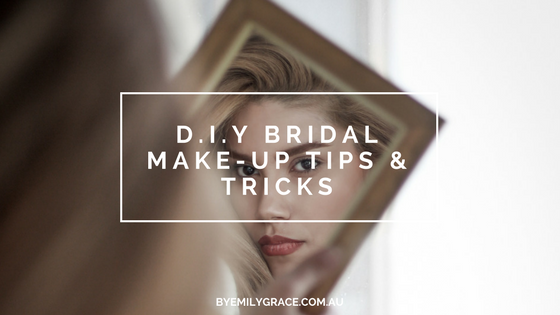 In this blog post, I'm going to share with you some of the secret tips & tricks that I teach in my private Bridal Make-up Masterclasses for D.I.Y brides just like yourself. One common misconception that I hear literally ALLLL of the time is that make-up needs to be caked on in order to look good in photos. Let me just say once and for all that this is NOT the case! If you look like a cake face IRL, I can 120% guarantee that in your photographer's fancy camera and your photos you will also look like a cake face. Yes, your going out make-up might look au naturel in your iPhone selfies, but your little iPhone camera cannot compare to your tog's fancy, thousands-of-dollars camera. To cover imperfections and keep the skin looking glowing and fresh-faced, I prefer to use a medium coverage foundation mixed with a CC cream. The foundation keeps the skin looking photo-ready, whilst the CC cream softens the appearance and adds extra dewiness to the skin, keeping that "no-make-up" look. I love to buff this into the skin using a dense fluffy brush, to really ensure that the foundation doesn't have the appearance of just simply "sitting" on top of the skin. 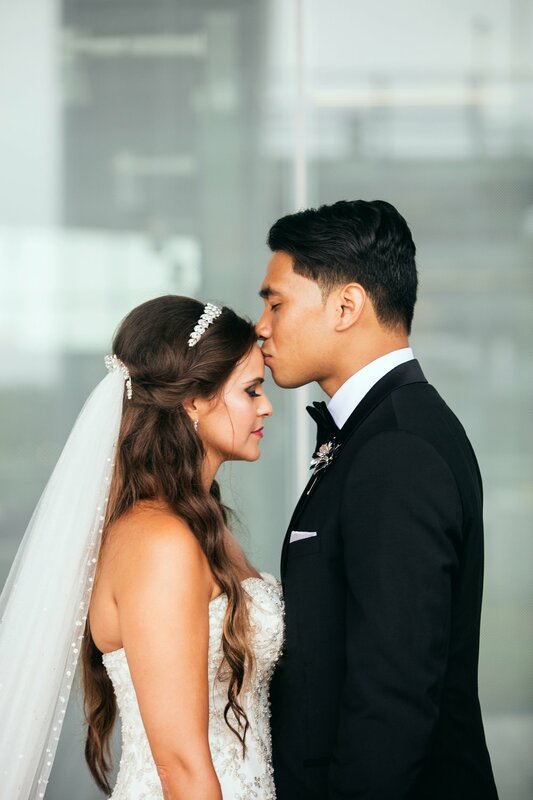 I like to work in light layers to really ensure that I'm not over-applying the foundation, because the only cake face that you want at your wedding, happens after your partner smushes your wedding cake in your face! If there are any pesky pimples or other imperfections that need a little more coverage, I like to use a liquid concealer in the same shade as the foundation mixture to conceal these areas. I always add a little of the foundation mixture over top, just to make sure that the skin still looks fresh. We've all seen those photos of ourselves at a night out looking whiter than a ghost just because Jane took the photo with the flash on, but did you ever learn why that happened, or did you just blame it on not getting outside enough this Summer? The reason why was that your foundation had a high SPF level, and Jane's photography skills were sub-par, as she took your photo with direct flash. In my experience, any product placed on your face with an SPF of 25 or higher will cause you to turn into Casper the Ghost in photos taken with direct flash (think photos taken in a darkened room off of an iPhone). Your photographer would never use a direct flash, and they generally don't take photos with a flash at all if you're getting married outdoors or in a well-lit venue. As the night starts to fall, photographers lean towards taking photos with an indirect, bounced flash, as the direct flash is not flattering at all in most cases. You also want to steer clear of any products marketed as been "HD" or "High Definition". Labelling products as HD has become more of a marketing gimmick lately, with nearly every product out there in stores being labelled as such. HD products are formulated to soften the appearance of the skin during film motion cameras, not in still photography. HD products will make your skin look flawless in your videographer's footage, but you'll look like Casper just ate a powdery marshmallow in your photo album! I've heard that many brides throughout my career say that they're not going to get emotional on their wedding day and that they want to wear the same mascara and eyeliner that they always wear. Trust me ladies- you're going to need waterproof eye products. You might think that you're not going to cry now, but when you're sleep-deprived, stressed to the max, holding a bunch of flowers that make you sneeze, and you see your fiance standing at the end of aisle waiting for you, you might just tear up even just a little bit. Interested in your own personalised Bridal Make-up Masterclass? Email us at hello@byemilygrace.com.au for more info!